Being a Lorrdian, Atrux has the gift of mimicry and the ability to read the most minute details of a persons body language, voice, and posture, and can infer much of the other party’s intentions, and emotions, from their body language and tone. As a Jedi, he has a strong gift in the art of Force Healing, that continues to evolve with age. Fien-and-Harp Atrux-Nuro was born into a middle-income family, his father, Tulm, a professor at one of the multiple campuses in Lorrd City, his mother, Anla, a nurse at a local clinic, and an older brother, Isasi, who worked with aquatic terraforming technologies. The household was well-adjusted, and Atrux’s childhood was as ordinary as the ice that covered his home planet, Lorrd, except for one matter: he was a Force-sensitive. When Atrux reached the age of eight, an old Zeltron Jedi Knight by the name of Zuza Truba came to Tulm and Anla regarding their youngest son’s affinity for the Force. Fearing their son’s safety, however, they declined Master Truba’s invitation for Atrux to train as a Jedi. This broke the eight year old Atrux’s heart, as he had heard epic stories about the Jedi blasting off to save some misfortunate soul from the clutches of the Argazdans, on their mission to free the Lorrdian people, his people. But almost as soon as the event was over, Atrux forgot about it, and continued on with his life, but always wondered about what might have been. At the age of fifteen, Atrux began to face his future. Only excelling in some biology classes at school and average in all other courses, Atrux hadn’t the slightest idea of what he wanted to do, regarding his future. He, along with most of his friends at the time, worked in a resteraunt washing dishes. Atrux’s hated his job and the doubt he heald for himself grew with each passing day. 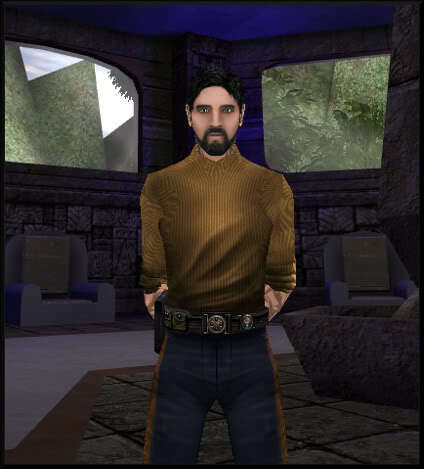 But, as if it was written in the stars, Master Truba returned to make one last bid for Atrux’s future as a Jedi. Delighted with such fortune, Atrux begged and pleaded with his parents to allow him to travel to Coruscant to begin his training as a Jedi. His parents still had some reservations, however. But seeing their son show such enthusiasm was a rather novel concept. Atrux seldom showed much enthusiasm for anything since his entry into Higher School and the departure of his brother. So, they reluctantly agreed. Atrux’s last memory of his parents was a worried mother and a proud father standing in the doorway of the only home he had known. At Coruscant, Atrux was submitted to various tests in order to determine his full empathy to the Force. And, determining him sufficient for training shipped him off to the Jedi Enclave at Dac for training. The Jedi Enclave of Dac felt quite at home for young Atrux. The ice reminded him of Lorrd, this memory comforted him. It was also, in his opinion, a nice change from his short stay on Coruscant. Atrux grew up in a relatively “small” city and the chaotic movement and noise made Atrux feel very out of place. On Dac Atrux spent a lot of his time with his Chiss friend Azrael. Azrael was a bit older than Atrux and quite frankly possessed a confliction personality. Azrael was alwats calm, complacent and very decisive. Atrux, on the other hand, could be described as Janus-faced. On one hand he was very confident and sarcastic, very hot headed and cynical, even for a young man. On the other hand, however, he often doubted himself and his place in the galaxy. He was taught to be a free-thinking individual, by his Mother and was therefor very rebellious. This non-conformist attitude would later cause Atrux a great deal of grief. On 258.25 Atrux was intitiated alongside Tel Koth by Master Ederoi. It didn’t take long for Atrux’s niche in the Jedi Order became clear to him. As out-spoken and foolhardy as Atrux seemed, he wasn’t much of a fighter. He had decided to learn to master the Art of Healing. There was only one “official” Helear on Dac. His name was Coren Ran. At the time Atrux met Coren, he was a freshly initiated Knight. For whatever reason, Coren took an interest in the over-eager Atrux. Atrux was apprenticed by Coren Ran in 260.21 at the age of seventeen. In only two years Atrux had made a large step on his path to knighthood. Over the years as Atrux grew older and progressed in training, his doubt of himself and his eagerness to prove his “worth” grew substantially. He began to act out and was always on edge. The stress eventualy forced Atrux to examine his behavior. He decided at the age of thirty to leave his new home of Yavin Four to work on New Holstice without the Council’s knowledge. A few cycles after his thirty fifth birthday he decided to return to Yavin Four, a changed man. Upon his arrival, he soon learned that his Master had also left the temple and effectively “dropped” him as an Apprentice. Atrux fought the feeling of abandonment and focused on his training. He had changed. Atrux saw many things on New Holstice and as a result had grown wiser. After a few years stay on Yavin Four, Coren had returned. Atrux was reluctant to face his previous Master and did his best to avoid him through the halls. The appearance of Master Ran had struck a chord in Atrux, re-awakening “old” feelings and impulses he had worked so hard to purge himself of. However, Atrux new, avoiding Master Ran forever was not possible. Master Ran sat down at the table across from Atrux in the dimly lit Cantina. He was drinking something from a thermos that, Atrux noticed, smelled warm and sweet. Atrux had put on a polite face and was determined to not show his “true” feelings during the conversation. Atrux was surprised by the topic of conversation. Master Ran had admitted that he had failed Atrux in his training and was determined to see him through to Knighthood. Atrux, shocked by this, accepted. “First impressions are everything”. Atrux had developed a bad reputation and found himself frequently trying to present himself to the knights in a “new light”. Whenever Atrux walked through the halls he could feel eyes burning into the back of his neck. Everytime he entered a room he couldn’t help but notice how the conversations would come to a halt. The shame he fealt for his past actions were unbearable. He knew he had a problem with his emotions, controlling them has always been a problem. But he pressed on, fighting the urge to flee, somewhere distant where no one knew him. Forty years old is an akward age for a padawan. Not many Padawans have ever reached the age of thirty much less forty. He was now introduced to a new conflict. As a man Atrux often felt above his title as Padawan. Padawans were seen as children to most and Atrux was no child. The Attrition was eventualy forced the Order to move to Azloc Three. As Atrux stepped off the transport and onto the freshly powdered soil, the brisk scent of ice lifted his spirits. A new home, a fresh start. Again.